The Irish Consulate in New York hosted a reception on Wednesday, September 26, on the occasion of the visit to New York for UN Week by the Tánaiste and Minister for Foreign Affairs Simon Coveney, T.D., and Minister Ciarán Cannon, TD, Minister of State at the Department of Foreign Affairs and Trade, with special responsibility for the Diaspora and International Development. The Tánaiste addressed a packed house about today’s Ireland, increasing Ireland’s global footprint and the challenges of Brexit. 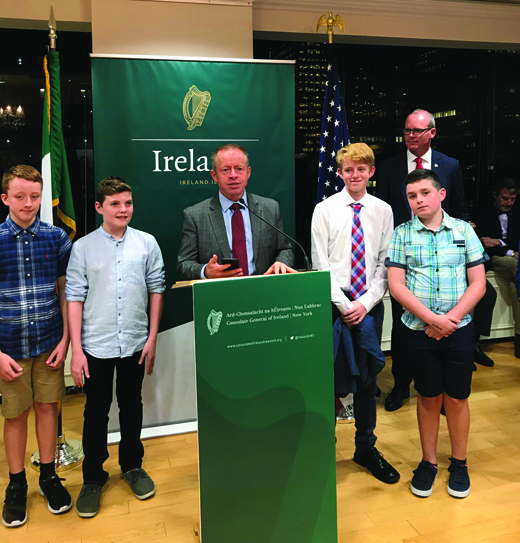 Cannon met with representatives of the Immigration Centers and with New York’s first Foróige group, from the Aisling Irish Centre in Yonkers. Participation in Foróige helps the young people develop their leadership skills and teaches them how to become actively involved in society and engage with their Irish heritage.